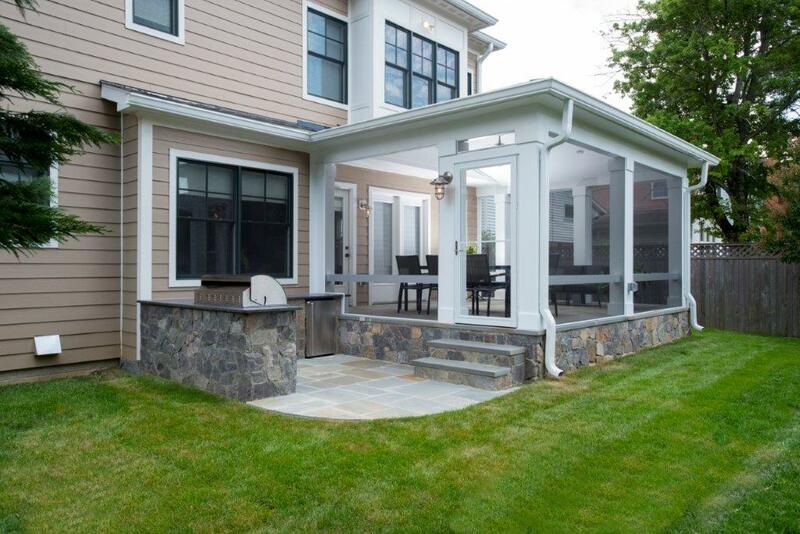 Flagstone is a hallmark of many new patio designs in Maryland, Virginia, and Washington, D.C.: It’s a durable, affordable, and handsome option for homeowners looking to add class to simple patios and walkways. However, its applications extend beyond simple groundwork and accenting. 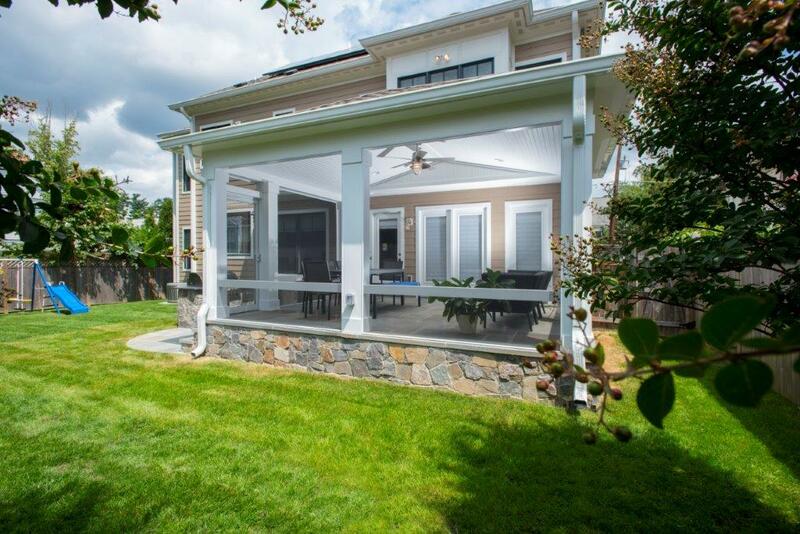 In Bethesda, Maryland, Pennsylvania flagstone was utilized to create this unique, elevated screened enclosure and an outdoor kitchen without the use of hardwoods or synthetic deck boards. This has the immediate benefit of eliminating unsightly gaps and sightlines associated with using planks for decks and other elevated structures. 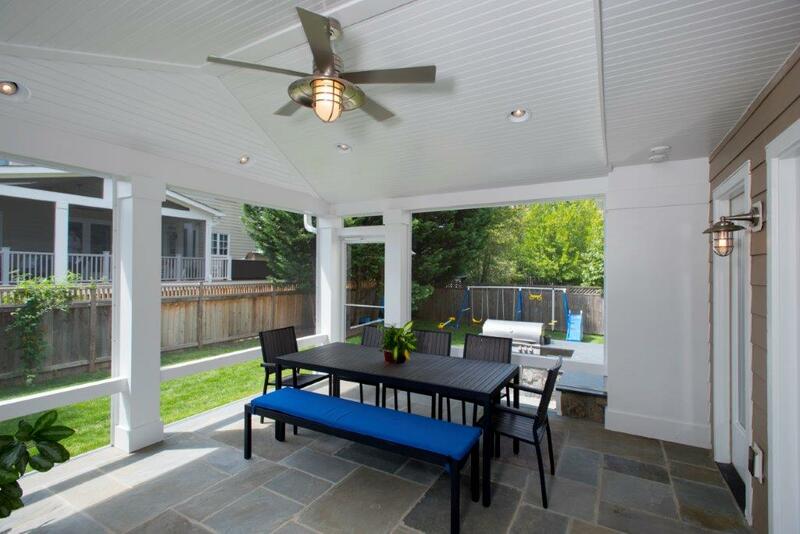 It also provides a visually consistent, structurally sound basis for the rest of the porch and patio’s design; flagstone feels unmovable and has a friendly color range. The 18’ x 15’ screened porch, which is raised approximately 24” above grade, features a natural stone veneer to match the house’s original stone as well as several upscale amenities. Its white pine beadboard open cathedral ceiling contrasts nicely with the neutral blues, grays, and tans of the flagstone, as do the PVC-trimmed beams that support the distinctive hip roof and patented SCREENEZE screening system. 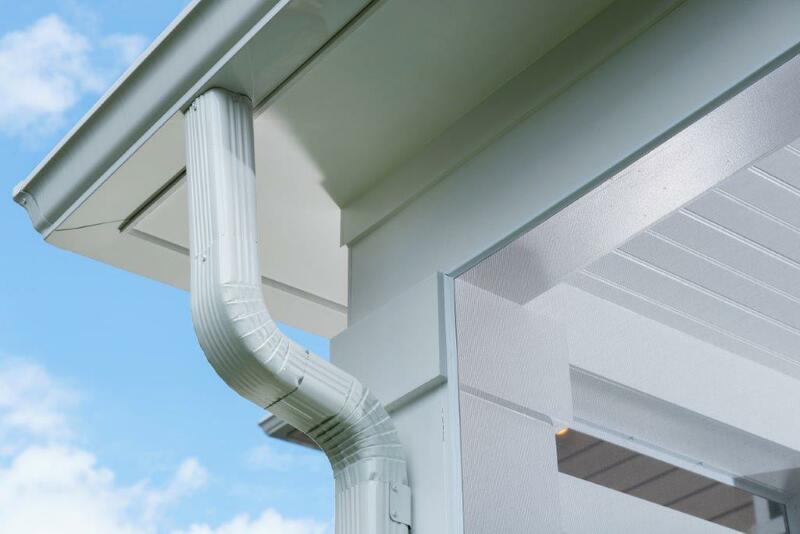 Other elements, such as the minimalist white PVC divider rails, gutters, and shingles, similarly cooperate with the forgiving flagstone color palette and the home’s existing materials. 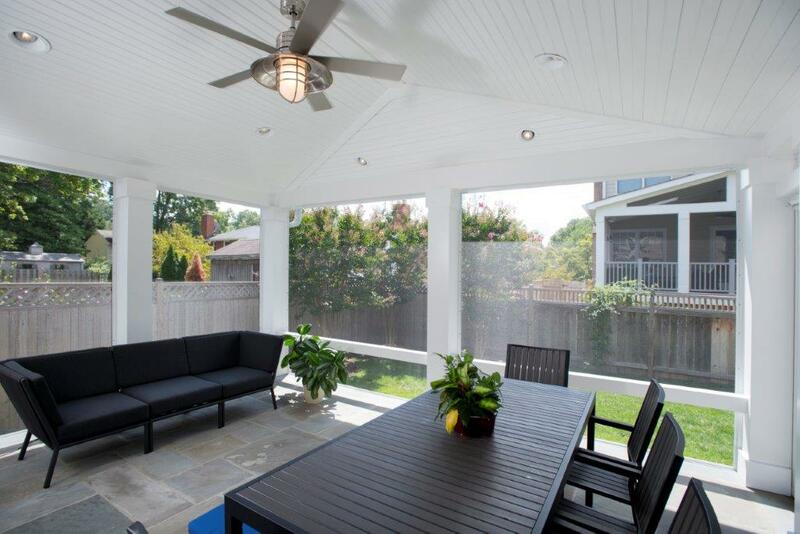 To maintain this room’s usability during the buggy D.C. area summers, an outdoor ceiling fan and aluminum screens [reside over the dining and sitting area, while 6 adjustable recessed lights account for mood, safety, and atmosphere under all lighting conditions. 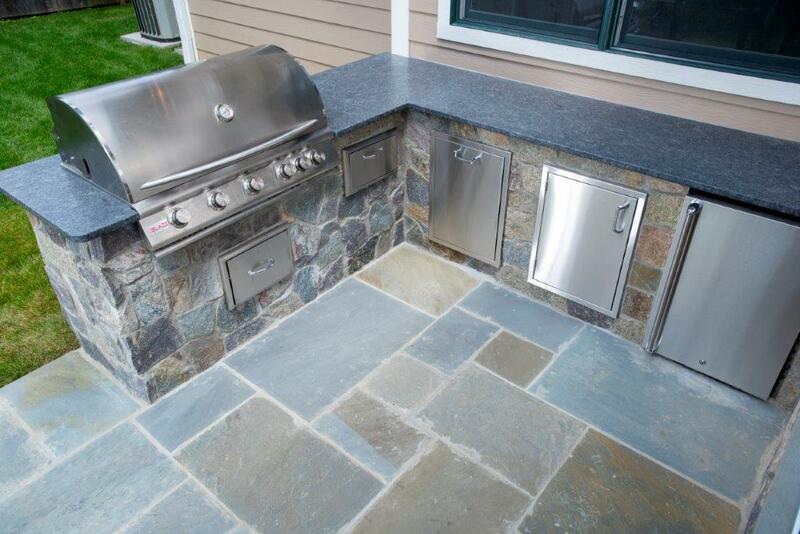 Flagstone steps and a Larson storm door separate occupants from the acid washed, thermal cap-bordered patio outside, where a flagstone kitchen is equipped with all of the musts for a legitimate barbecue. The outdoor kitchen cabinets are 15’ long, have 30’ sq of countertop, and are framed 36” tall and 24” deep to offer plenty of custom storage space. One of the cabinets even functions as a hidden crawlspace entrance beneath the house, presenting a slightly solution to cellar doors not attainable in modular or otherwise standard cabinet options.